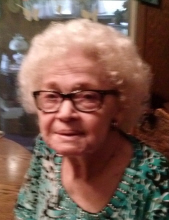 Mary A. Bartholdi, 91 of Conroe, Texas passed away Friday, January 25th, 2019 in Conroe. She was born to Robert and Myrtle Rivia on April 17, 1927 in Beaumont, Texas. She enjoyed gardening, cooking and entertaining family and friends. Left to honor her memory is one sister; Alice Cessac of Vidor, TX; sons David Carroll and wife, Anita of North Richland Hills, TX, David Bartholdi and wife, Melda of Hemphill, TX, daughters Kathy Wright of Conroe, TX, Jolynn Wars and husband Shanon of Groveton, TX, Lori Jacks and husband, Buck of Milam, TX, as well as 11 grandchildren, 16 great grandchildren and numerous nephews and nieces. She is preceded in death by her husbands; Carl David Carroll and Joseph Louis Bartholdi, sisters; Rosie Whitmire, Dorothy Newton, Gertie Mathues, Doris Baker and Joan Johnson, son-in-law; Leland Wright and grandson; Jacob Holmes. Mary's family would like to thank Park Manor of Conroe for the Wonderful care they gave our mother. Graveside services will be held at 10:00 am Friday, February 1, 2019 at Restlawn Memorial Park in Vidor. To send flowers or a remembrance gift to the family of Mary Aster Bartholdi, please visit our Tribute Store. "Email Address" would like to share the life celebration of Mary Aster Bartholdi. Click on the "link" to go to share a favorite memory or leave a condolence message for the family.